While inheriting a home can be a complex process, it can become even more complicated and lengthy if you're in bankruptcy. In Florida, for example, a probate case takes an average of four to eight months, depending on the circumstances, and then putting a house on the market can easily stretch this timeline further. If there are any challenges from other beneficiaries or heirs, this will further prolong the legal transfer of the property. When you file for bankruptcy, a court-appointed trustee takes control of your financial affairs and must approve the sale of any inherited property. Once the sale takes place, the proceeds are also subject to the trustee's oversight. When you file for bankruptcy protection, you must disclose all assets, liabilities and income. If during the process you gain an inheritance, you must report it to the bankruptcy trustee. While you are repaying creditors through a chapter 13 plan, and until the case is dismissed or discharged, any new personal asset you acquire, such as inherited property, becomes part of your bankruptcy estate that is under the control of the court and the trustee. If you fail to report assets, the trustee can move to dismiss the case, which would end the court-ordered stay on collections and lawsuits against you. You must file a motion to sell, with a completed contract of sale, to sell a house while under bankruptcy protection, whether or not the house is inherited. This informs the court of the terms of the sale, as well as the expected expenses associated with the sale. The court must approve the sale and decide on how the proceeds will be used. If the sale results in a capital gain, then that gain may still be taxable, according to IRS rules. Bankruptcy does not suspend the obligation to pay income tax on capital gains, investment income, or wages and salaries. Further, under most circumstances, bankruptcy law does not allow a debtor to discharge tax debts in bankruptcy. 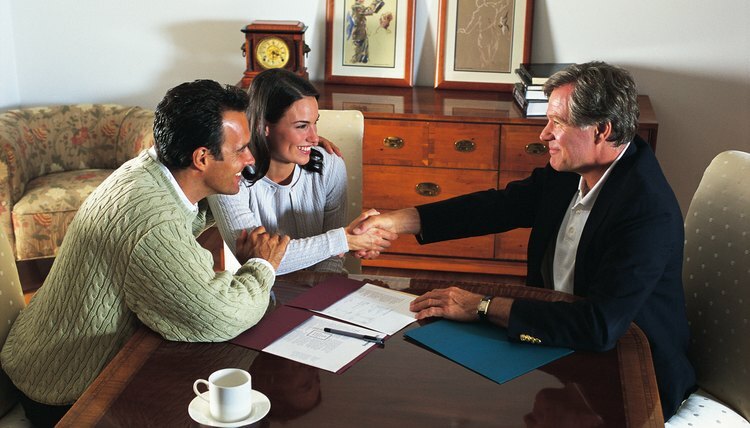 The court trustee will require several completed documents before approving the sale of a home. These may include a title report, a closing statement and new bankruptcy schedules showing income and expenses after the sale if you don't intend to pay off the chapter 13 plan. If you are planning a payoff and a bankruptcy discharge, the trustee may also ask for copies of tax returns that are currently due. The law also requires notice of the sale to all creditors, who have the right to file an objection to the sale as well as any payoff and discharge. A chapter 13 bankruptcy differs from chapter 7 in several respects. A chapter 13 trustee, for example, will not liquidate property to repay creditors. Instead, chapter 13 involves a repayment plan with regular monthly installment payments coming from your income. This means that you may remain in an inherited house without fear of having it seized; you also have the option of renting it. Keep in mind that you must report rental income to the trustee as well as the IRS -- and it may affect your repayment schedule. Schwartz Bankruptcy Law Center: Will I Lose my House if I File Bankruptcy? Florida Probate Solutions: How Long Does Probate Take in Florida? DuncanLawOnline: Can I Sell My House During My Bankruptcy? What Happens If You Sell Your Personal Property Before the Bankruptcy in a Chapter 7 Discharge? Can You Sue a Person When You Are in a Chapter 13?